Clocked Out is a collective founded by Vanessa Tomlinson and Erik Griswold who create and produce innovative music, interarts, and intercultural events. Their work extends on experimental traditions in engaging and thought provoking ways. The Listening Museum, organised by Clocked-out, was hosted by UAP and took place in their workshop areas. 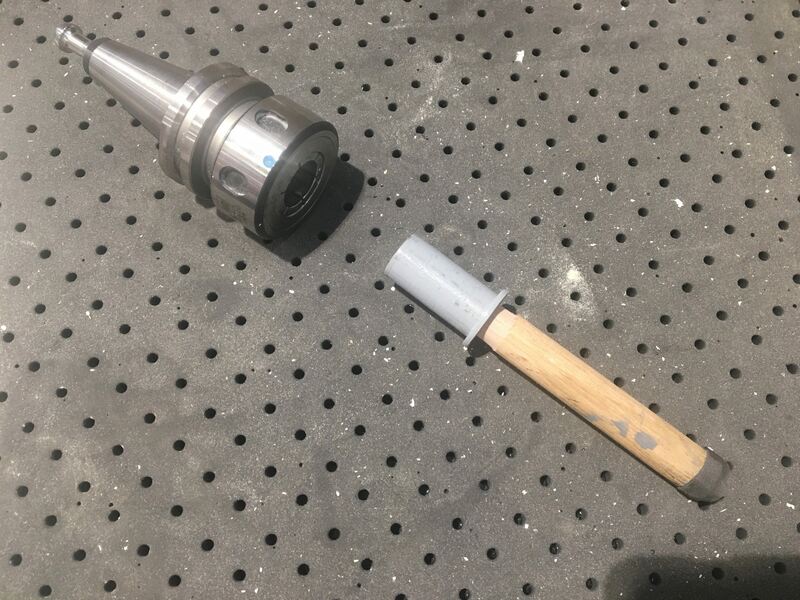 Musicians, sound and performance artists, got together to explore the affordances of a factory setting provides in relation to unique sonic experiences. By registering to this mysterious, surprising and unexpected event, the audience found themselves in a curious sonic environment. Each audience member was free to explore, interact and experience the non-linear mashup of sonic ideas in their own ways. 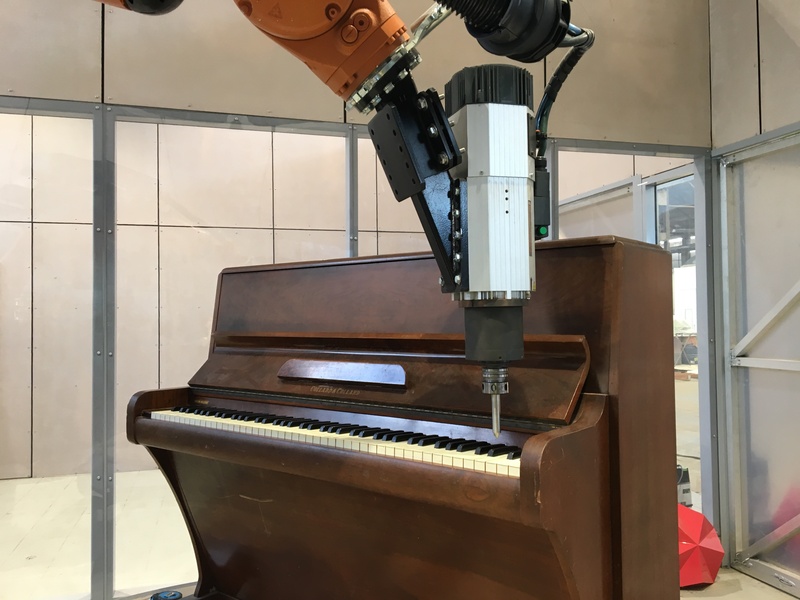 For this event, the Design Robotics team contributed to Erik Griswold’s piano composition for Marvin (KUKA Industrial Robotic Arm in UAP) by programming the robot. 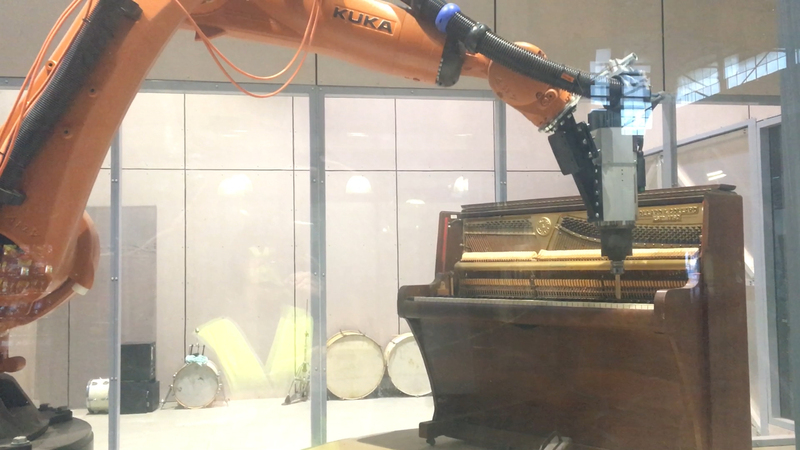 The collaboration with the artist, resulted in a unique performance of the giant robotic arm, playing a classic wall-type piano. For the performance, a special end effector was designed to imitate the flexible movement of a fingertip. The gentle touch of the end effector on each piano key was programmed by using Rhino and its plug-ins for parametric design Grasshopper and KUKAprc. The midi file of the piano composition was converted into a text file by an open source software called Anvil Studio. The text file was then disassembled into respective parts such as notes, notes on/off, duration. The piano was then modelled into Rhino, with the exact dimensions and its location in relation to the robotic arm. In Rhino, the end effector of the robot arm, was aligned with the central points of each piano key, using KUKAIprc. Marvin performed three times during the event, with a total of 100 spectators. The crowd was very engaged and entertained with the performance. It was a great exercise for us to work with Marvin in an artistic way, test some of the workflows and tackle some of the design issues in regards to programming a creative design work.